Our rental and product guide has everything you need to create a truly memorable event. Be inspired by our vast collection of over 20,000 specialty rentals. Or, let us create a custom collection for you. Nothing stands in our way of delivering your dreams and making your vision come to life. You can also download Illusions 2017 Price Catalog if you like. The shape of table and style of chair can set of the tone for your whole event. Casual or elegant, modern or classic, whatever the look you’re going for, we can help you achieve it. Be creative and put square tables together to create a “family-style” dining atmosphere or mix and match square and round tables for an interesting room set up. At Illusions Rentals and Designs you will be able to find exactly what you need to create the theme and design you’ve been envisioning. Most of our chairs come in a variety of colors providing you with the ultimate selection. Our furniture selections vary from contemporary to classic, offering a wide range of options for every event. With everything from plush couches to contemporary banquettes and LED ottomans to classic rattan, you’re sure to find something that will fit your design and style perfectly. Incorporating furniture into your event creates intimate, comfortable sitting areas for your guests making your event even more memorable. There are so many options and styles to choose from we’re sure you’ll find something you love. Rent our pristine kitchen collection for all of your events, whether large or small. Blenders, indoor and outdoor grills and processors are all available for your corporate events, large-scale events, sport event entertaining and more. Elegant and casual serving accessories will complement your dining experience adding that extra touch of style and practicality. Our essentials include serving platters, bowls of all sizes, shapes and materials and matching serving sets. View our versatile collection of serveware at your local Illusions Rentals and Designs showroom. Our unique tabletop rentals include chargers, napkin rings place card holders, unique accessories, and props. We have the just the right finishing touch to fully express your tabletop theme. Visit our showroom today to view our wide selection of mercury votives, candles, candlesticks, candelabra and accessories. Click the links above to see the spec sheets for each of our mobile event solutions. Our fleet of mobile event assets includes everything needed to host large guest counts virtually anywhere, making any destination the perfect venue! 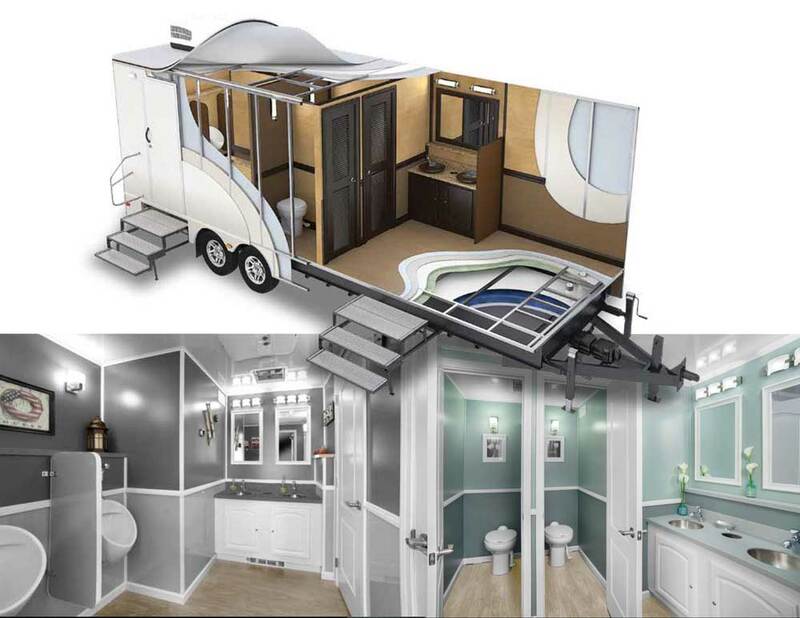 Our industrial-scale mobile kitchens can prepare thousands of meals every few hours, and our new luxury mobile restroom and shower trailers can deliver VIP comforts to austere environments. Our rental fleet also includes multiple ADA-compliant, handicap-accessible restroom and shower trailers to serve guests with special needs. These facilities are ideal for a range of event, industrial, commercial or emergency response needs, as well as anywhere wheelchair accessibility is legally required or operationally desired. Wherever you want to party, we’re ready to roll! Learn more.